This course has tested and developed my problem solving skills and has challenged me to innovate to counter the engineering problems I have faced. I am currently on a MEng Aeronautical Engineering course. City is known for being the first ever institution in UK to introduce aeronautical engineering courses. Given City's heritage and prestige along with its world-renowned experts in the field of aeronautics, whose ground breaking research demonstrates their passion and desire. Combining all the above with City University having to offer high tech laboratory facilities for practical work, stimulating course structure and ever so important the guidance of such passionate aeronautics experts. I believe this is what made City University the ideal choice of university to study at and turn my dreams into reality. Furthermore, the course is accredited by Royal Aeronautical Society, Institution of Mechanical Engineers and the Engineering Council. I enjoy the relationship I have with my lecturers and PhD students. 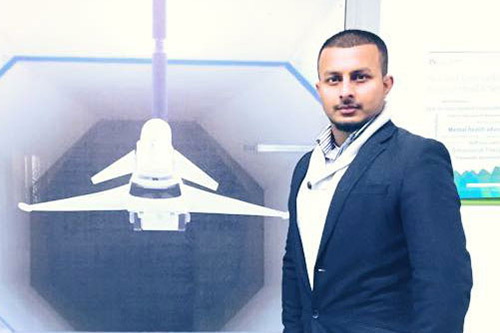 I have utilised my course as an interface to form professional relationships with my lecturers and PhD students, which has allowed me to keep up with the latest research and developments in the field of aeronautics and mechanical. This course has enabled me to enhance my knowledge and understanding of physics and engineering principles, tested and developed my problem solving skills and has challenged me to innovate to counter the engineering problems I have faced. The support from City staff has been absolutely crucial and credit must go to relevant groups for listening to all our problems and providing us with adequate solutions. I believe as an aeronautical representative that the engineering department staff have been sensational and have organised wonderful events for our career development and future job prospects. My two favourite modules are Aerodynamics and Fluid Dynamics. These two modules were by far the most challenging modules I have come across and they did push me to my limits. However, in the end my efforts to master these modules were well rewarded as I obtained a first class in these modules. There are several highlights from designing and manufacturing a Wind Turbine using plastic water pipes and spaghetti in Year 1 to being taught Aerodynamics in Year 3 by the chairman of Royal Aeronautical Society Professor Chris Atkin. However, the most important highlight along with receiving a yearly scholarship for my academic performances has been my individual project. The project involved preparing and calibrating an NI DAQ system for trisonic/supersonic wind tunnel and furthermore using schlieren technique to capture shockwaves over a 2D wing. The project was very rewarding and involved in-depth discussions with many of the university staff members for their expertise to counter the choking problems and get the wind tunnel running effectively and efficiently. I plan on joining the RAF and becoming a chartered engineer. Then, I would like to pursue a career in teaching and research in aeronautics field.